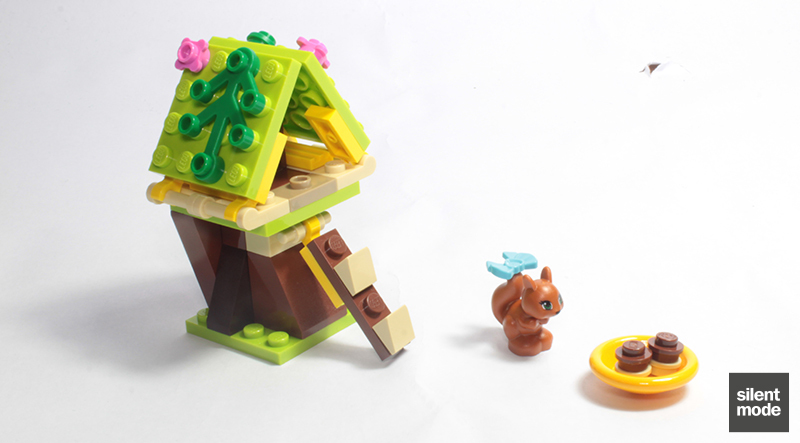 Create a cozy home for the Heartlake City squirrel! 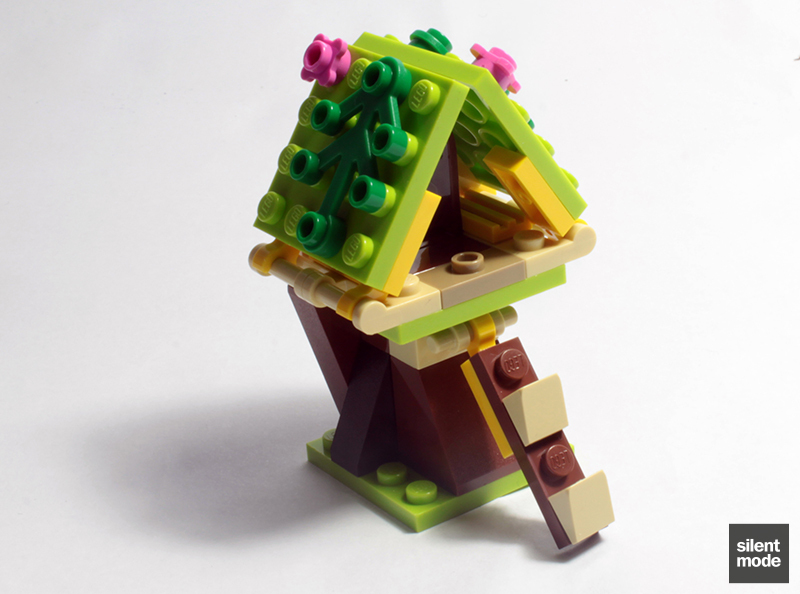 Build a leafy hideaway for her, high above the ground, with LEGO® bricks! Start with a sturdy tree-trunk foundation and top it off with a mossy roof! Make a ladder with steps that lift or lower and open the roof to play inside! 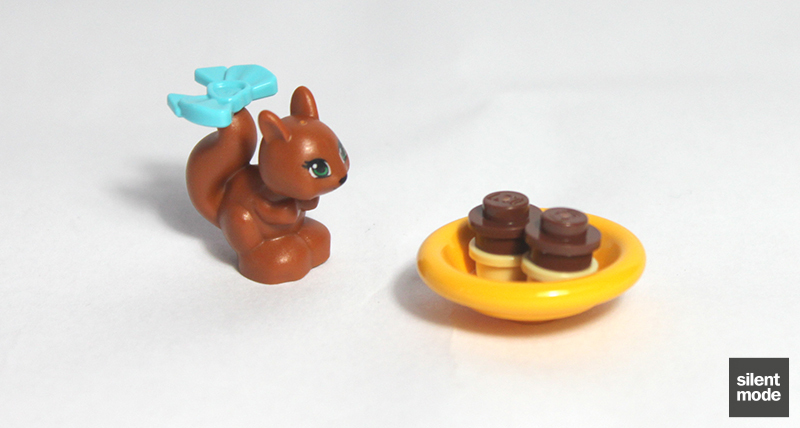 Leave her dish full of acorns nearby and put the pretty bow in her tail to make her the happiest squirrel in the city! Take care of the squirrel online at LEGO.com/friends and download more building inspiration for this model. Combine with 41018 Cat’s Playground and 41019 Turtle’s Little Oasis to create a bigger house for all 3 animals with building instructions available on LEGO.com/friends. Lower the ladder to climb into Squirrel’s Tree House! 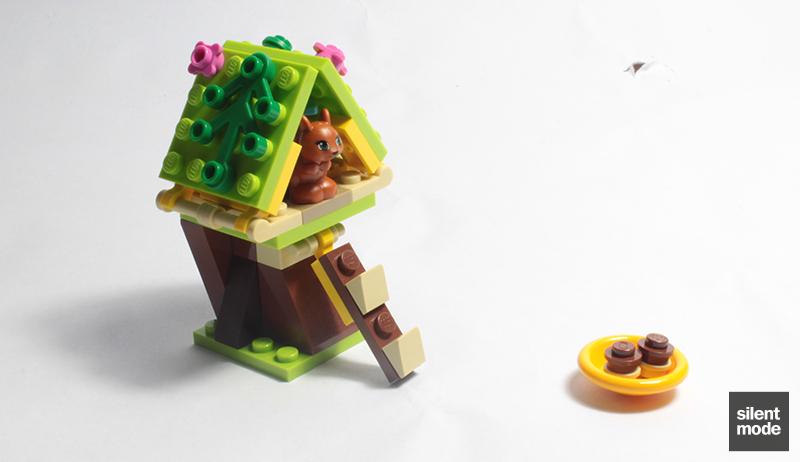 Take care of the squirrel online, or find more building inspiration at LEGO.com/friends! Fast becoming a typecast Friends reviewer, this is SilentMode once again with a review of one of this year’s most anticipated themes: Friends’ own Collectibles Series 1. 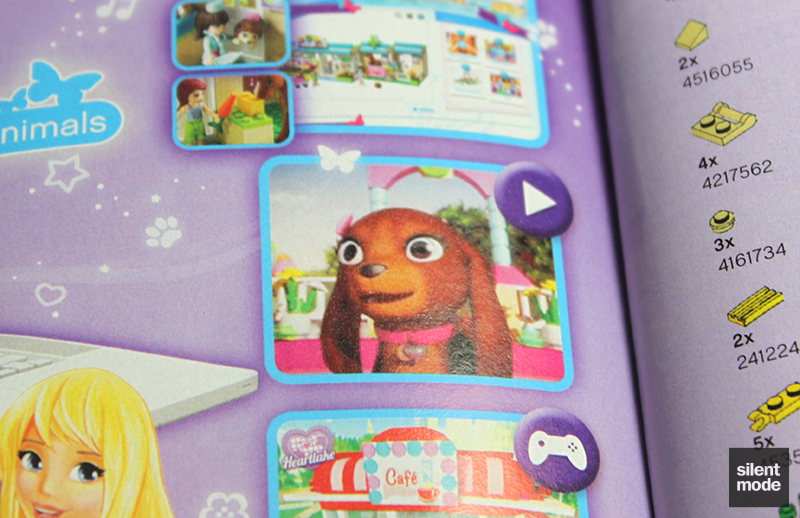 I’d first heard about them after looking at a retailers catalogue, and I was initially sceptical of the concept… at the same time I was curious about what the animals would look like, as well as how they would fare even with the popularity of the Friends theme. They’ve been released only in the last week, and naturally I’ve gotten hold of a complete series – the only difficulty being to find somewhere that would sell them! 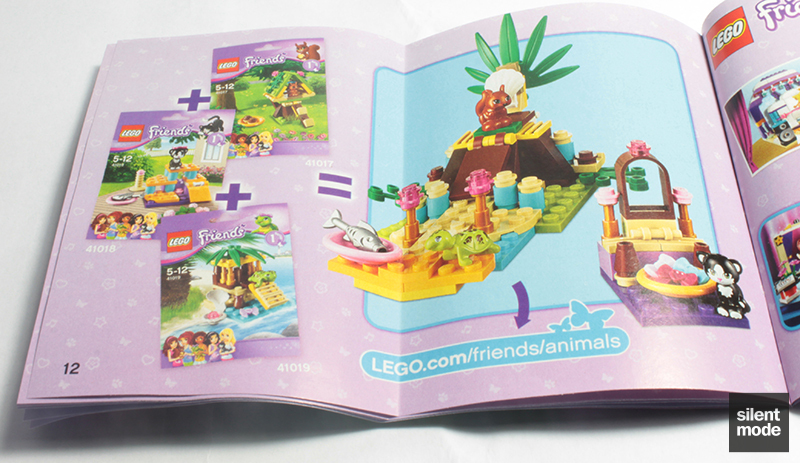 Unlike the Collectible Minifigures, each of the animals featured in Series 1 has its own set number, so I will be doing three separate reviews. You’ll also be pleased to know that each animal is evenly distributed: not only are they sold individually and clearly identified, but if you come across a whole box you’ll find eight of each inside. We’re presented with a big plastic bag, with material thicker than polybags, resembling a pack of beef jerky. As mentioned before, each pack identifies the animal included inside, so no need for the feeling technique (and likely embarrassment). 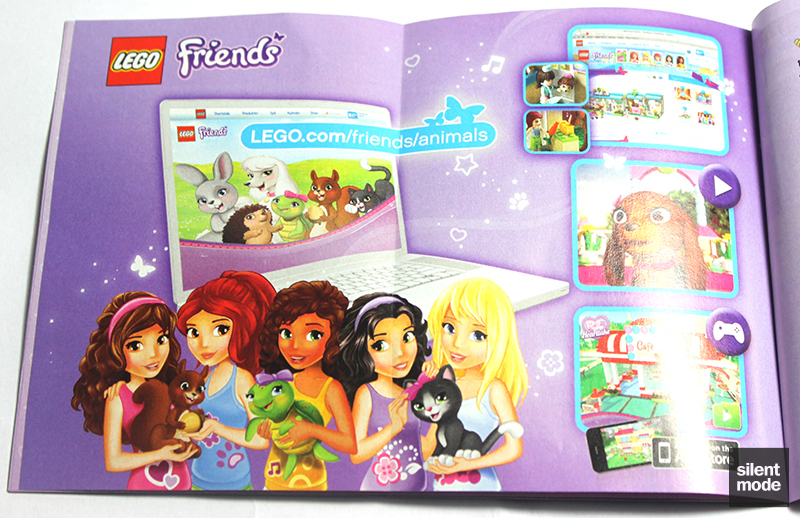 You’ll also see the main Friends characters in the bottom left, who have been reduced to secondary roles on this pack, petting each of the Series 1 animals. Rather amusingly, LEGO’s barcode printer had a rough time trying to print an apostrophe. Perhaps someone tried to use a curly quote instead? Very naughty. A small warning: you will require something sharp to open the bag, as there’s no assistance provided. This is probably a good thing, given that some people (nonFOLs) have seen fit to rip open bags of Collectible Minifigures, and even books with exclusive figures included with them, in the past. Inside the bag we have a smaller bag containing all the parts, as well as a folded but otherwise crisp instruction book. Pictured here are all the parts we get to play with. Sadly there are no exclusive parts to look forward to, but the Medium Azure bows also appear in another of 2013’s Friends sets, Stephanie’s Soccer Practice. Here is the star of the show, and from the looks of things an early fan favourite. 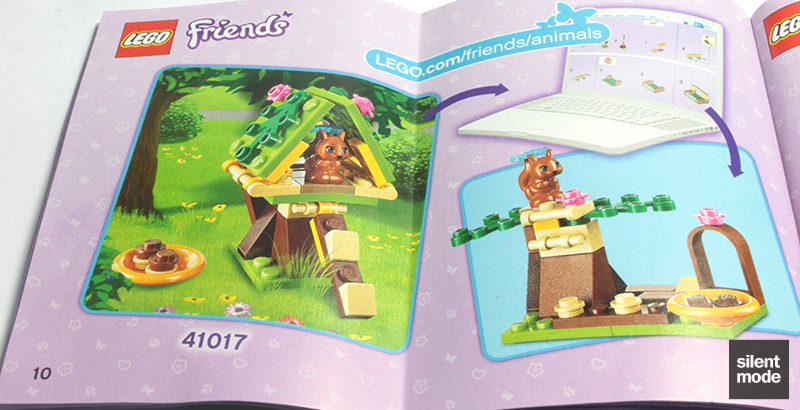 Although the squirrel isn’t named in the above description from LEGO, it’s identified as female. 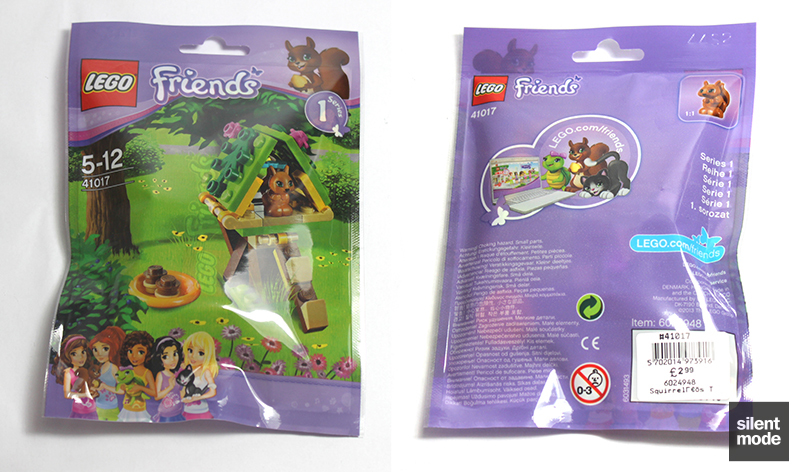 One thing that wasn’t made obvious from the packaging and preliminary pictures was the presence of the squirrel’s tail. On the whole I quite like the shape of the animal, including the cute little ears, and it would have made a better accompaniment to Olivia’s Tree House than, say, that darned kitten. 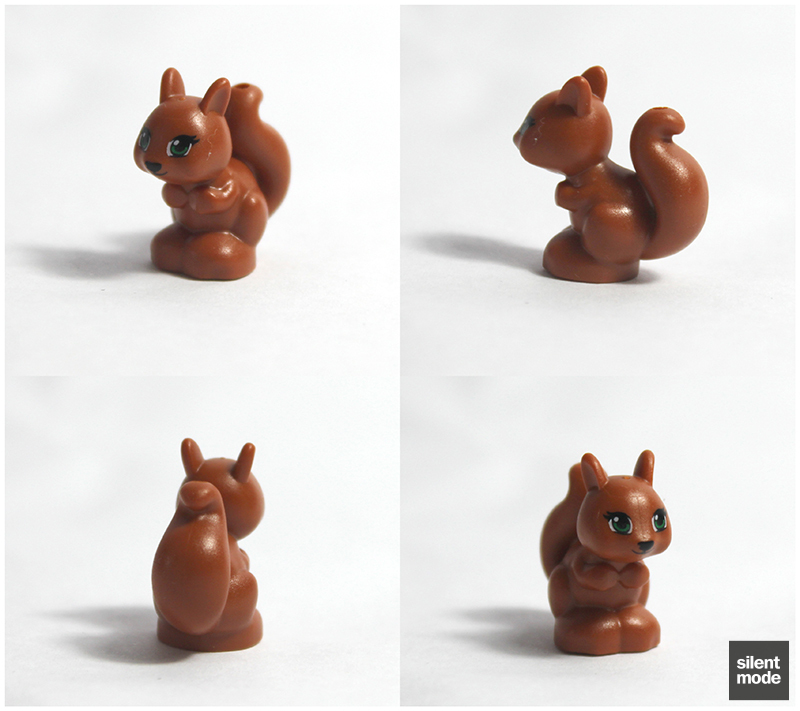 The squirrel has one space on its entire mould for a Friends accessory, and it’s been inexplicably placed on the tip of her tail. I guess it’s as good a place as any for a squirrel. The first thing we get to “build” is some food for the squirrel. Being juvenile-minded as I was at the time, I thought these were squirrel droppings… but no, they are rather clever acorns. I hadn’t actually seen acorns in years, as they’re not so common now. They do look delicious, though. We begin building the tree house for the squirrel by building the trunk, of course. The whole trunk is constructed with Reddish Brown and Dark Brown slopes of varying sizes. The foundation of the tree house is a little intriguing, but it will all come together very soon. A tiny stepladder is also added, because squirrels don’t always feel like climbing. The remaining two Lime plates are attached to the tree house like wings, potentially turning the tree house into a private aircraft (if we want it to be). Those plates fold upwards to form the roof; the curved window in the middle allows the plates to meet in the middle without distortion. That’s really clever! With the aid of the Dark Tan jumper plate, the squirrel can sit proud in the tree house constructed for her. Very helpfully the roof can be separated – without casualty – to take the squirrel out or put it back in. Every now and then the squirrel may be tempted out of its throne by a couple of juicy acorns. You may be surprised to see a generous helping of leftovers: two extra bows (perhaps for the other animals in the series) and some other small but useful parts. You could always make a couple more acorns if you wanted to fatten the squirrel up. 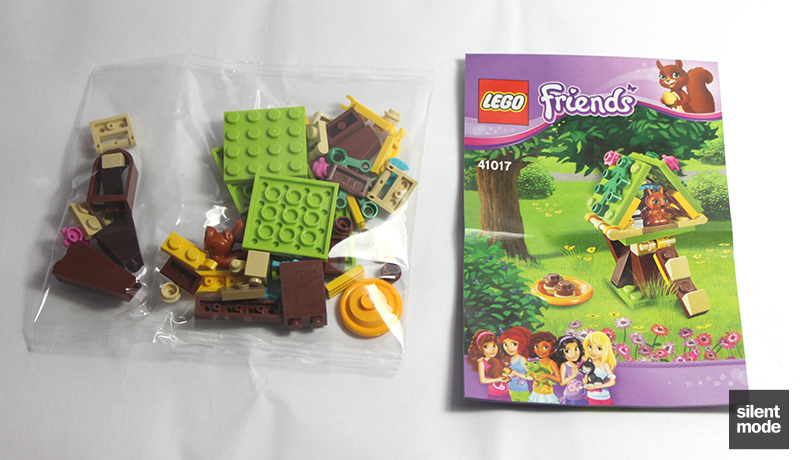 Very interestingly LEGO have introduced an alternative build for this set in the back of the instructions. 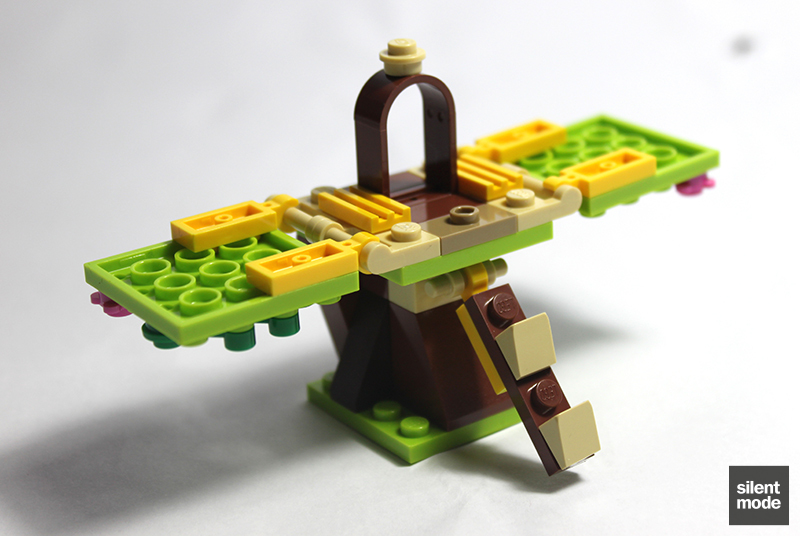 More info on how to create this build can be found on the LEGO Friends web site. Collect all three of the Series 1 animals, however, and you can build something even bigger: something resembling an tribal-style animal temple. One where squirrel is king. Or queen. Not much else to see in the instructions, except for another picture of the main Friends characters, wondering how long it will be before I review the rest of them. If Tan or Reddish Brown was used in place of Yellow, I would have given full marks. I can't fault the design of the main build, nor do I have anything negative to say about the squirrel; although accessories fit on its tail, it's something different. A relatively quick and easy build with no stability issues, and I like the fact that the tree house doesn't have to be taken apart to remove or add the squirrel. 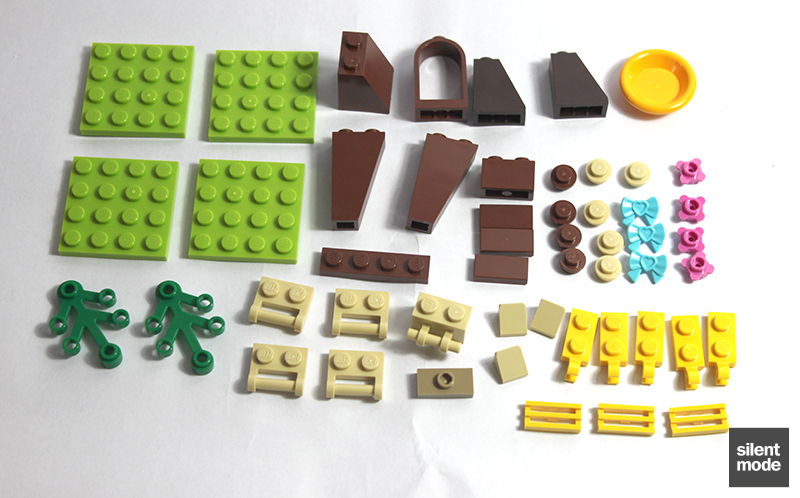 The parts used in the build all have a purpose, and we're left with useful spares for other things as a result. Would make a great addition to existing Friends sets or even Town/City MOCs. How about a row or network of squirrel tree houses? At GBP 2.99, this is arguably the best value for money at RRP I've seen from LEGO in a long time. Consider that the squirrel itself, as well as other popular Friends animals, will likely cost just as much on its own. Based on these scores, squirrel gets a very decent 8.8/10. Stay tuned for reviews of the other animals in this series!